Style is not something that can be taught, you either have it or you don't. Looking at the cases that are available on the market, it's clear that most have absolutely no idea what looks good and what looks, well, plain terrible. Cooler Master is one of the few companies out there that continually design nice cases. Just check out what the case modders use, there are so many tweaked out Cooler Master cases because they're designed so well. No real modder in their right mind would touch something that's has the name Thermaltake or *gasp* NZXT on it. 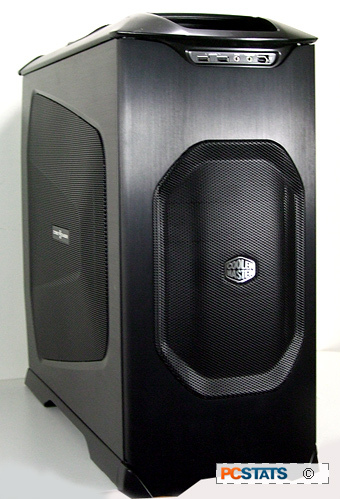 The Cooler Master Stacker 830 SE continues Cooler Master's tradition of solid cases. Along with its sleek cool look, the Stacker 830 SE was clearly designed for an enthusiast computer user. Internally the case is an absolute breeze to work with and with all the space available, you'll have room to fit even the biggest videocards. You won't need many tools when working with the Cooler Master Stacker 830 SE. It's not entirely tooless but most of the major components can be tweaked with just your hands. With the ability to carry a massive six 120mm case fans (two are included with the case), the Cooler Master Stacker 830 SE might also be considered the ultimate overclocker's case. Heck it already comes with rubber pass through holes which allows you to use watercooling. No need to drill holes in your case with the Stacker 830 SE! With such large air vents on every side, the Cooler Master Stacker 830 SE may be a bit louder than your normal case, but if you find noise an issue just turn down/off one of the many fans in the system. If you like to put your computer on the left side of the monitor and find the door annoying simply change the way it opens. It's nice that Cooler Master put such attention to detail when designing the case. With a retail price of $202 CDN ($300 USD, £148 GBP) for the case alone, the Cooler Master Stacker 830 SE is not cheap but then none of the high end cases are. It certainly is unique and one of the best looking cases to pass through PCSTATS test labs in a long time. Looking online, most stores do not bundle a power supply with the case, if you want the Cooler Master Real Power Pro 1000 RS-A00-EMBA power supply, that particular model retails for $304 CDN ($430 USD, £215 GBP). If you're looking for a case that will make the rest of your computer friends jealous, the Cooler Master Stacker 830 SE can do just that. Or if you just want something that looks good without being too flashy the Stacker 830 SE does that too. The case just beams class, unlike most alternatives on the market.